All of Thanksgiving in a hot pocket style hand pie. Make and refrigerate your pie dough a day before use or up to a month before (in this case freeze it and thaw in fridge). Place all your leftover ingredients in separate bowls for the assembly line. You can use all, some or more of what I listed above. Including pumpkin or apple pie! Prepare two small ramekins. One with water to seal the pies, the other with 1 tbs water and 1 egg beaten for egg wash. Remove one dough disc from fridge and roll it out to 1/4" thickness on a lightly floured surface. Take a 5" glass bowl, invert it to use as a dough cutter to make the rounds for the pies. Add a small amount of each ingredient you've decided to use to the center of each 5" round. Maybe 1 Tbs each. More of the turkey. Careful not to overfill. I'd suggest trying one out and getting a feel for the amount that fits. Dip you finger in the ramekin with water and rub a little water around the very edge of the dough. Flip the top edge over to the bottom and press slightly to seal. Crimp the edge with the prongs of a fork. Poke each pie on top with a fork for air vents and place them on a parchment lined baking sheet. Preheat oven to 375. When ready to bake, brush the tops of each hand pie with the prepared egg wash. Bake for 25-30 minutes or until golden brown. Wait about 5-10 minutes before eating! Don't burn your hands on the hand pies! 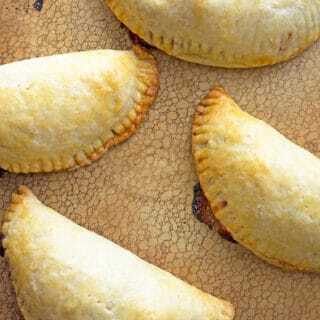 Unbaked hand pies can be frozen and baked anytime this fall/winter.